IsilexLite v1.2.2 (Basex 8.6.4 compliant) is a Web Server, a CMS (Content Management System) and an XML Database Driver System linked to BaseX available under License OpenGPL v.3. It's also a Private Social Network Organizer producing high-quality XML data file. Unlike a product like WordPress, IsilexLite can host your Web site directly onto your own machine in your Business place or your laboratory, or even at home, and lets you directly make your Work reachable thru the web. It allows you to link Multimedia content to your XML files. The Web Server for IsilexLite is a Java HTTP server and container. It is a web server based around the user conception called REST, invented by Roy Field in the 1990sw, and which allows one to associate a programming algorithm to a URL. When you access IsilexLite, it is ‘system ready’ on whatever platform you are using. You simply have to start it up. You will see a small ruler icon appear in the system tray adjacent to the time icon. Click on ‘open Isilex’ and it is then up and running. You can begin to work with it straight away, i.e. you can start creating files, annotations, and a corpus. Since it is programmed in Java, BaseX and its wrapper Web IsilexLite, work on any platform and do not need to be installed. Create Redactors groups for every task of my project. Create and manage multiple databases; allow one Web Database to be displayed while another is used by contributors. Export to .odt (Office) or PDF your datas: one file at a time, or a group. Creating a file in Isilex. There are two ways of creating files in Isilex : either by means of the input template, and through the XML editor. - “Form” formats the information provided so that it is in recognisable forms of words, and then the “Orth” field allows Isilex to look for an orthographic form of that word, and the “Pron” field furnishes information on the pronunciation of that word. -“GramGrp” brings together the information furnished in grammatical order. - The “Gram” field provides grammatical information on that word. - The “Etym” field provides etymological information about that word. -The “Sense” field brings together the information concerning the meaning of that word, with the “Usg” field furnishing details on the usage of the word (for example “archaic”). - The “Def” field furnishes a definition of the word. - The “Note” field allows a commentary to be added. - The “Quote” field allows one to indicate a quotation in which the word is found. The following field furnish details on the source of the quotation. - The “Editor” field contains the name of the editor of the work in question. It is also possible for the compiler to add as many fields as s/he would like (for example, by adding two “Orth” fields) or by adding directly other field groups (within all the fields that are regrouped under “Form”, “GramGrp”, “Sense” or “Cit”). Isilex is conceived as an editing tool for developing different kinds of online textual corpora. It is based on an editorial system which enables the editing of files for annotating the corpus. 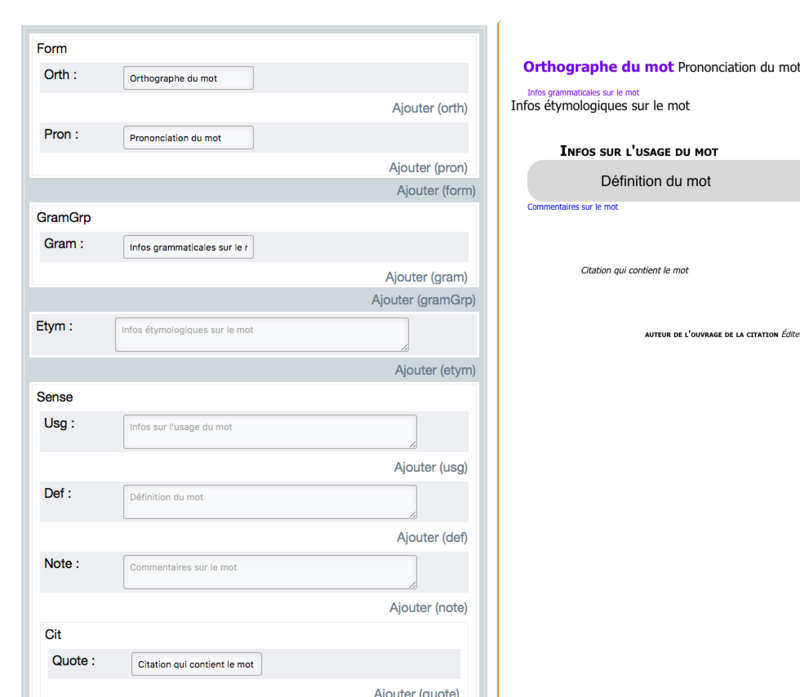 The annotation is undertaken on the basis of the field-name “orth”, and whenever Isilex finds a lemmatised form of “orth” in the corpus it automatically creates a hyperlink in the form of a note indicator. It is extremely easy to navigate around the corpus by means of Isicorpus. Once the corpus has been loaded up, it is immediately searchable through the search engine, and the annotation system is automatically available. It is possible to edit the corpus either on line or by batch. You can also edit in pdfs, and make interventions in the database, either online or via Basex. It is also possible to modify the CSS [“Cascading Style Sheets”] online. You can simply click directly in the text of the corpus, once it has been uploaded. There is an online menu which allows you to safeguard directly the edits that you have made, and to visualise the markup that has been integrated into it, or to consult the epub file online. It is important to grasp the philosophy behind Isilex. It is based on an approach which is entirely noSQL and is integrated around XML. It has been conceived on the one hand as a means of integrating textual corpora, and on the other hand as a way of providing notes to the corpora, with all the results searchable by a semantic-led search-engine. The links are made through exploiting libraries in full-text X-Query for the lemmatisation, the indexation and the stemming. It therefore provides a software engine for automating the publication of textual data online. You can publish a text or corpus by uploading it, and then your team can work on the files, and both intersect. 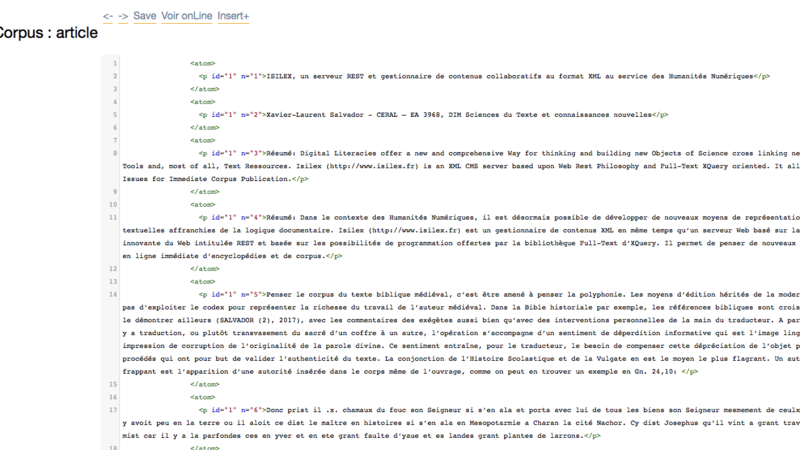 The alphabetical list (at the top right-hand of the screen) in Isilex links to a collectonm of XML files in a TEI/dictionary format. When Isilex encounter a format for which there is a file, it automatically creates an annotation, an indication in the form of a hyperlink in the margin of the corpus in question. Isilex is thus a tool that is designed specifically for Web-based editions. The Web Server for Iselex is a Java HTTP server and container, running the database engine BaseX. It is a web server based around the user conception called REST, invented by Roy Field in the 1990sw, and which allows one to associate a programming algorithm to a URL. When you access Isilex, it is ‘system ready’ on whatever platform you are using. Since it is programmed in Java, BaseX and its wrapper Web Isilex, work on any platform and do not need to be installed. - The first is to reconfigure Eclipse Jetty as your principal server. In that case, you need to modify the servlet container in the Web.xml configuration file with a tet editor. Change the port to port 80 and restart Isilex, which will now listen to port 80. Isilex’s great strength is that it is a ready-to-use package. All the same, users who want to wor up their own particular applications to suit their research needs can do so very easily. At the base-level of Isielx there is a repertory called “Webapp” which contains a file entitled “Additional.xqm”. |You can easily add REST (representation state tranfer) functions here in order to implement your own efforts (to find out more on the Xquery syntax to be used in REST. Consult http://docs.basex.org/wiki/Repository. That is all that you need to do. Once you have saved that file, you can simply open your application at the address: http://localhost:8984/mon Appli and, as though by magic, the application launches.